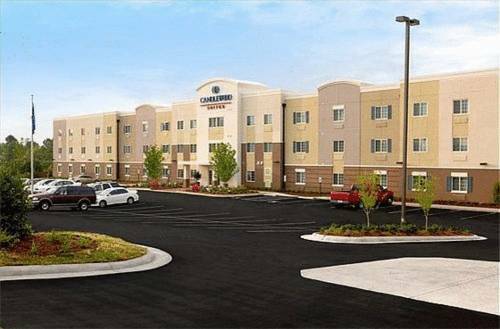 Benefit From Hotel's Excellent Service in San Antonio, TXLocated in the suburbs of north San Antonio, the Candlewood Suites San Antonio N - Stone Oak Area hotel is a preferred choice among both business and leisure travelers. Whether you're staying for one night or an extended stay, this hotel's San Antonio, TX accommodations offer comfort and convenience for a carefree visit.We've got everything you need to have a productive business trip in San Antonio. All the hotel's suites include free Wi-Fi access and an executive work desk, so you can catch up on work. Additionally, we are surrounded by top local companies, including Tesoro, Pearson, Nu Star Energy and Valero.Ideally situated in San Antonio, the hotel's convenient location on the north side of the city is within minutes of the area's best sights. Six Flags Fiesta Texas offers thrilling roller coasters, rides and water attractions for the family. Explore the unique Natural Bridge Caverns, which feature tours, ziplines and rock panning. We're also a short drive from popular downtown attractions, such as the Alamo and River Walk.When it comes to extended stay hotels in San Antonio, TX, we've got some of the best amenities around, including a 24-hour Fitness Center, sparkling outdoor pool and free guest laundry facilities. The Candlewood Cupboard is open 24 hours a day and sells a variety of snacks, meals and sundry items. We look forward to serving you on your next trip! Canyon Springs Golf Club, recently voted Best Overall Public Golf Club in San Antonio as well as Reader's Favorite. Located in north central San Antonio at the edge of the beautiful Texas Hill Country, resides admidst the original Claussen Homestead. Main Event is your number one family entertainment destination for bowling, billiards, laser tag and more! Enjoy food, family and fun!